James Fallows of The Atlantic has written a long and entertaining essay about Gov. 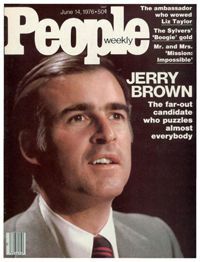 Jerry Brown that is miles better than the usual East Coast journo’s take on California politics, probably helped by the fact that he grew up in Southern California. But the passage that I most enjoyed was the part where Jerry Brown disguises his political cowardice with, of all things, an ego trip. In commenting on education policy. the governor makes it clear that he simply understands the issues with a clarity that others don’t. Oh, boy, is this groan-worthy on multiple fronts. No one — NOBODY — says teacher accountability is the sole answer. 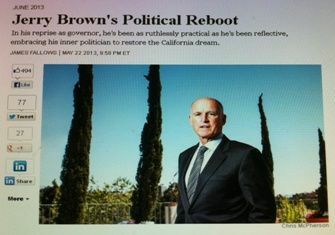 That’s a pure straw man for Jerry Brown. Reformers just say teachers are really important. They’re absolutely right. Brown is right that our education reforms haven’t worked as well as we would hope. He’s also right that lots and lots of smart people have offered different theories over the years. But to suggest, as Brown does, that this means we don’t know anything is just goofy. “The fifth-graders at Broadous Elementary School come from the same world — the poorest corner of the San Fernando Valley, a Pacoima neighborhood framed by two freeways where some have lost friends to the stray bullets of rival gangs. “Many are the sons and daughters of Latino immigrants who never finished high school, hard-working parents who keep a respectful distance and trust educators to do what’s best. “The students study the same lessons. They are often on the same chapter of the same book. “Yet year after year, one fifth-grade class learns far more than the other down the hall. The difference has almost nothing to do with the size of the class, the students or their parents. “With Miguel Aguilar, students consistently have made striking gains on state standardized tests, many of them vaulting from the bottom third of students in Los Angeles schools to well above average, according to a Times analysis. John Smith’s pupils next door have started out slightly ahead of Aguilar’s but by the end of the year have been far behind. “In Los Angeles and across the country, education officials have long known of the often huge disparities among teachers. They’ve seen the indelible effects, for good and ill, on children. But rather than analyze and address these disparities, they have opted mostly to ignore them. Jerry Brown’s talk about Comenius and John Dewey is just a smokescreen to hide the fact he doesn’t want to take on the CTA and the CFT. So he derides the emphasis on teacher accountability. I wonder when Fallows will realize that he was snowed.